REDSTAR Double block and bleed 3PC trunnion ball valve mainly using industrial pipeline. 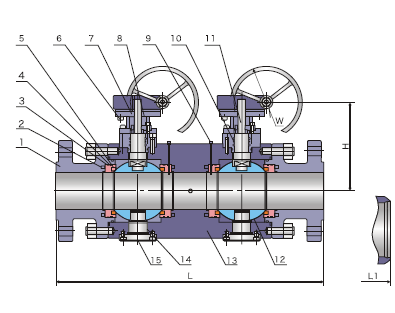 Double block and bleed ball valve are dsigned in order to replace the multiple valves connection complex forms in traditional pipeline.Reduce the leakage in system to achieve quickly bleed. close function.Double block and bleed ball valves maxmium save installation space and simplied installation program.Cut down the pressure in piping system.Convenient instrument Cleaning maintenance and reduce the costs. The dimension of conneting flange can be design according to customer's requirements.